Location: Dupnitsa is town in Southwestern Bulgaria. It is situated around Dzherman River at the northwestern foothills of Rila Mountain. 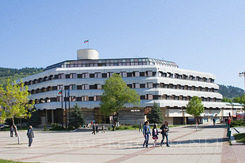 The town is 68 km south of Sofia, and 39 km east of the district town Kyustendil. History: The first information about the town appeared in 15 century in the ottoman register, after the ottoman invasion. During the 18 and 19 century the town developed as an ore mining centre. The population of Doupnitsa was very active in the national liberation and education movement during the Revival Period. There was a girls’ school, and the monastery school developed into a public school soon after its foundation in 1856 – 1857. The town’s industrialization started in 1860 – 1870 and Doupnitsa turned into a main tobacco and home-woven cloth producer. After the Liberation the name of the town was changed several times. It was called Stanke Dmitrov, Marek and at last Dupnitsa again. Today Dupnitsa is well developed industrial and pharmacy centre. Sightseeing: The places of interest in Dupnitsa are the Art Gallery, the History Museum, the clock tower and the churches in the town. 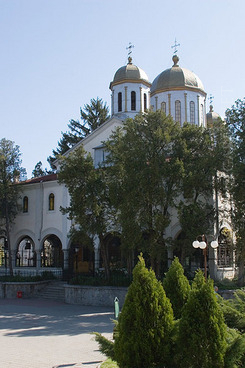 Vicinities: Resilovo Monastery is 7 km east of Dupnitsa. Sapareva Banya is 14 km northeast of Dupnitsa, which is situated over the ancient ruins of the Roman town Germania. It is a famous Spa centre. Panichishte mountain resort is 14 away from Sapareva Banya in Rila Mountain. It offers excellent conditions for relaxation and tourism and it is a perfect training base for the entry level skiers during the winter.